Abbreviations. Chapter 1. Introduction. 2. Methods of cell counting and assaying cell viability 3. Centrifugation 4. Unit gravity sedimentation 5. Centrifugal elutriation 6. Aqueous two-phase partition 7. Electrophoresis 8. Affinity chromatography 9. Affinity separation on fibers and surfaces 10. Affinity partition 11. Flow sorting 12. Magnetic cell sorting 13. Separation of cells in different phases of the cell cycle Appendix. References. Subject index. Methods of Cell Separation brings to the attention of researchers at all levels the variety of methods available for separating viable populations of cells. Methods are grouped into 3 categories based on the criteria of separation, namely; size or density; non-specific surface properties; and specific surface properties. The principle of each method is described together with general and, where possible, specific protocols for conducting cell separation experiments. A central theme of the book is the separation of populations of blood lymphocytes which is used as an example for each method. 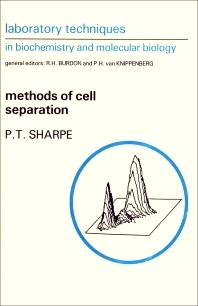 Methods of Cell Separation is distinguished by three powerful assets: descriptions of the majority of cell separation methods currently being used; details of the experimental procedures involved in each method; and comparisons of the different methods for separating cell populations with particular reference to blood lymphocytes. An excellent addition to a distinguished series, and extremely useful as a laboratory manual.